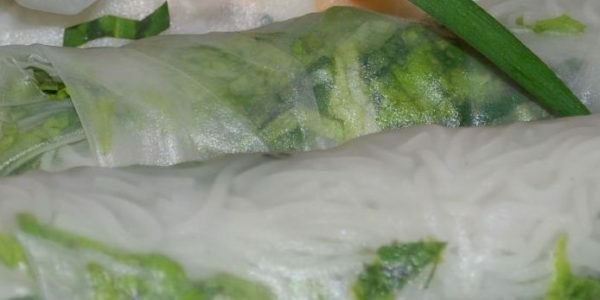 Easy to prepare spring rolls, excellent as an appetiser for any stir fried vegetable dish. Cut tofu and carrots into thin sticks. In a bowl, mix the tofu with the soya sauce and place in oven in an oven proof baking dish. Bake for 20 minutes in preheated oven. Place bean noodles in a bowl and soak in boiling water for a minute. Spread the soaked rice papers on a towel to dry. To produce the rolls: In the middle of the rice paper, place a handful of bean noodles, topped by the tofu and then a carrot stick, avocado slice and a few bean sprouts. Sprinkle the roll with soya sauce and place in preheated oven for 5 minutes.